Far from being the first! Who was the first man to fly solo across the Atlantic? Who was the first man to fly in a single-pilot aircraft across the Atlantic? Who was the first man to fly a fixed-wing aircraft across the Atlantic? Who was the first man to fly non-stop across the Atlantic? Who was the first man to fly in a heavier-than-air machine across the Atlantic? 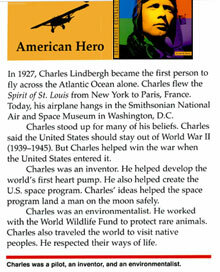 Charles Lindbergh was not the first person to fly across the Atlantic — not even close! The fact is, Lindbergh wasn’t the first, nor the second, nor the third, nor anywhere close to the top ten. Some 80 people had made the trip before Lindbergh came along. Neither was Lindbergh the first to fly non-stop across the Atlantic, nor the first to use a fixed-wing aircraft (as opposed to a floating airship) for the purpose. Numerous textbooks continue to hail Charles Lindbergh an American Hero, errantly citing him as the first person to fly across the Atlantic! The very first transatlantic flight took place in 1919 (Lindbergh had absolutely nothing to do with it), when Lieutenant Commander Albert C. Read flew the Lame Duck, a Navy Curtiss NC-4 single-pilot flying boat for this purpose. After several engine breakdowns and floating at sea, he made it from New York, USA, to Lisbon, Portugal. In 1924, Lt. Lowell H. Smith and Lt. Erik H. Nelson took off on a journey of 26,100 miles on a round-the-world trip beginning and ending in Seattle, Washington. In 1926, Ramon Franco flew across the South Atlantic in a twin-engine flying boat from Spain to Buenos Aires, Argentina. He was hailed as the “Columbus of the Air” in Latin America but received little notice in North America. From 1919 to 1927, an additional 78 people successfully flew across the Atlantic before Lindbergh’s attempt—a total of 81 people successfully flew across the Atlantic before Lindbergh. Finally, on May 20, 1927—8 years after the first transatlantic flights, and after 81 other people had already flown across the Atlantic, some of them solo—Lindbergh made his famed Atlantic crossing. Flying the Spirit of St. Louis for 3,600 miles in 33 hours, he went from Long Island, New York, to Le Bourget, close to Paris, France. Besides being an Aryanist, Nazi sympathizer and bigamist, Lindbergh was the first person to fly between New York and Paris without a support team and/or companion aircraft (which still does not mean he was the first to fly as a solo pilot or the first to fly across the Atlantic). 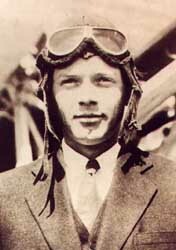 Lindbergh was the winner of the highly-publicized $25,000 Orteig Prize offered by the French-born New York hotelier Raymond Orteig (Lafayette Hotel), who designated the prize for the first person to fly nonstop in either direction, between the cities of New York and Paris (although many a successful transatlantic flight had already been made by others by this time). Lindbergh was the first to have the progress of his transatlantic flight covered live by public-access radio. Scores of listeners in France had been glued to their radio sets following developments of his trip, and had rushed out to meet him when he landed. Due to the unexpected effect of this mass-media coverage and spontaneous public interest, Lindbergh entered popular culture, a.k.a. the collective consciousness of mankind, to be known — incorrectly — as the “first man to cross the Atlantic in a plane.” Through the years, this myth came to be accepted as a “fact” that was taught in history books across the world, which is a pure testament to the power of mass media to misinform and create myths. It would be more accurate to hail Lindbergh as the World’s First Mass-media Hero — he was well aware of its power and manipulated it thoroughly to his advantage. At first a shy man in public, Lindbergh learned quickly to adapt, to play up to the public and perpetuate the egregious falsehood of his achievements. He never corrected the exaggeration about his being the “first,” but chose instead to capitalize on his fame, and to ride on the generated publicity and utilize it to his full advantage. Lindbergh relentlessly used his misdirected fame to help promote the rapid development of US commercial aviation, as well as propagate racial supremacist ideology. By 1936, the formerly shy Lindbergh had become a seasoned celebrity, public speaker and political meddler. He visited Germany as an unofficial ambassador of the US, attending the Summer Olympic Games as a guest of Field Marshal Hermann Göring. In 1938, Göring, on behalf of the Fuehrer, presented Lindbergh the Service Cross of the German Eagle for his contributions to aviation, which Lindbergh wore proudly for many years, despite protests from an appalled American public. Overconfident in his popularity and the support for his views, Lindbergh began speaking openly against Jews, only to be denounced as an anti-Semite, his own in-laws turning against him. But despite his his tarnished reputation, by 1941, the once-shy Lindbergh had become so adept at using his influence and manipulating the mass media, that he was able to bounce himself right back into the game. When the US entered the war on two fronts against the Germans and Japanese, Lindbergh, ever the avid aviator, was eager to fly combat missions against the Japanese (but not the Germans). However, the slighted President Roosevelt would not allow him to rejoin the military, declaring that, “You can’t have an officer leading men who thinks we’re licked before we start.” Lindbergh proceeded to use his influence to land a job at United Aircraft, run by Henry Ford, who was also known for anti-Semitic views. Supposedly an observer and civilian consultant to develop aircraft engines, Lindbergh, in actuality, flew more than 50 combat missions in the Pacific Theater. By 1945, when it was clear that both Germany and Japan were losing the war, Lindbergh began to backpedal on his earlier statements, but never going as far as to admit that he had been wrong about anything — certainly not about his Aryanist views. He withdrew from public attention and worked quietly for a few years as a consultant to the chief of staff of the US Air Force. One could easily surmise that during this time-out from public life, Lindbergh, who was by now no novice to using the power of the media to his advantage, must have figured that the best way to undo his damaged reputation would be to once again play up his exploits as the Great Aviator and tout his dubious achievements of being The First. In 1953, after 25 years of coasting on his popularity with a misinformed public about his being the “first” to fly cross the Atlantic, Lindbergh published a self-promoting autobiographical work, The Spirit of St. Louis, which won him the Pulitzer Prize (credit where credit is due, it was actually some good writing). In a two-part narrative “about flying and an aviator’s life in the beginning of the 20th century,” Lindbergh detailed the planning and execution of “the first nonstop flight between the continents of North America and Europe.” Interestingly, the book was 14 years in the making before its release, and numerous revisions were made to the manuscript afterwards, in many places. By 1954, Lindbergh had re-emerged with a Pulitzer Prize in hand, and his untruthful and undeserved reputation of being the “first” and therefore “best” had been restored; his controversial racist and political views were now suddenly overlooked and forgotten, displaced by his comeback fame. President Dwight D. Eisenhower matched the new turn in public opinion by restoring Lindbergh’s commission and appointing him a Brigadier General in the Air Force. PanAm eventually hired Lindbergh as a consultant and he helped to design the Boeing 747 jet for them. Lindbergh is also known for the tragic kidnapping and murder of his infant son, Charles Augustus Lindbergh Jr., in 1932, which came to be known as the “Crime of the Century.” The resultant trial generated so much media interest it was called the “biggest story since the Resurrection.” (see The Lindbergh Kidnapping on Wikipedia). Among his lesser claims to fame, Lindbergh is supposed to have been the “first” to come up with the idea of an artificial heart, and had approached French surgeon Alexis Carrel with a design in the early 1930’s. But among other laughable and dubious claims repeated across the Internet, is one of Lindbergh “inventing” space travel. That would be equivalent to “Al Gore invented the Internet” (although he never actually claimed that, by the way). If Lindbergh, who died in 1974, was such an eager achiever and perfectionist, the question that begs to be asked is: why didn’t he just tell the truth, that he was never the first person to fly across the Atlantic? The answer may be that he was simply a man who lived a lie. That would be plausible, considering not only his double-speak about where his true loyalties lay in WWII, but the fact that he had numerous secret love affairs and even maintained a secret second and third family, which resulted in seven illegitimate children. In 2003, DNA tests on three German siblings confirmed that the famed aviator was their father. David and Dyrk Hesshaimer, and Astrid Bouteuil, who requested the tests, said that Lindbergh had carried out an affair with their mother, Brigitte Hesshaimer, from 1957 until his death in 1974. It was later revealed that Lindbergh also had four other children in Europe: Two by Hesshaimer’s sister Marietta, and another two by his personal secretary, Veleska. Lindbergh’s rewriting of history has been so succesful that, despite these posthumous revelations, he will probably continue to be hailed a hero in history books for generations to come. To me however, he is no hero, just a great achiever, but the kind who died never doing the right thing. Was Lindbergh a Nazi? — Lindbergh accepted honors from the Nazi government in 1938. In 1941, he advocated noninterventionist policies against Axis aggression, using as his platform the America First Committee (an American isolationist organization). He further used his fame to spread this message internationally, preaching the futility of resisting German advances politically and militarily. His writings are replete with references to anti-Semitism, Aryanism and the racial superiority of whites. He said, “Racial strength is vital—politics, a luxury.” Many of his statements echoed Hitler word for word, blaming the Jews for stirring up conflict. In 1939, Lindbergh delivered his first nationwide radio address in which he urged America to remain neutral in the war. "Arrives Le Bourget Aerodrome, Paris after 33 hours, 29 minutes, and 30 seconds. Lindbergh lands at Paris' Le Bourget airfield, becoming the first pilot to fly solo across the Atlantic Ocean."